Peter Beinart in the Crisis of Zionism (2012) posits that Benjamin Netanyahu doesn't trust Barack Obama, and probably never will. The reason is simple: Obama reminds Netanyahu of what Netanyahu doesn't like about Jews. Understanding what Netanyahu doesn't like about Jews requires understanding what Vladimir Jabotinsky didn't like about Jews. For if Obama's Jewish lineage runs through Arnold Jacob Wolf to Abraham Joshua Herschel, Netanyahu's runs through his father, Benzion, to Jabotinsky, the spellbinding, romantic, brutal founder of Revisionist Zionism. What Jabotinsky didn't like about Jews was their belief that they carried a moral message to the world. When the Jews had land, an army, and a state, the Revisionists argued, nationalism held this emasculating moralism in check. But when the Jews were dispersed, they turned weakness into a virtue by valorizing religious ethics and religious ritual at the expense of military power. Zionism should have solved this, since it focused on reclaiming land, sovereignty, and--for the Revisionists especially--military power. The settler movement played a key role in Netanyahu's rise to power, so did the leaders of American Jewry. In the 1980s and 1990s, Netanyahu did not merely forge close ties to the American Jewish establishment; he helped to create it. Netanyahu's familiarity with American culture is legendary: he attended high school in the United States, attended college in the United States, attended graduate school in the United States, was first married in the United States, got his first full-time job in the United States, and held American citizenship until he was in his thirties. He also began his governmental career in the United States, when, in 1982, he became a political attaché in the Israeli embassy in Washington. The 1980s were a hinge decade in organized American Jewish life. With Republicans in the White House and Likud prime ministers in Israel, the venerable, civil-rights-minded Jewish institutions--the America Jewish congress, American Jewish Committee, and Anti-Defamation League--were losing power to AIPAC and the Conference of Presidents of Major American Jewish Organizations, which lacked any connection to domestic liberalism. Netanyahu, with his perfect English, inspiring family story (his older brother, Yonantan, had been the only Israeli commando to die in the famed 1976 hostage rescue mission at Entebbe Airport in Uganda), and facility on American television, became a star of the American Jewish lecture circuit. and as a Revisionist with no ties to Zionism's socialist heritage, he was perfectly placed to build ties to the conservative Jews who were gaining influence in an American Jewish establishment newly freed from its own left-liberal roots. In Washington and then in New York, where he served as Israel's ambassador to the UN, Netanyahu grew close to Malcolm Hoenlein, who in 1986 became the top staffer at the Presidents' Conference. Netanyahu also developed friendships with the cosmetics heir Ronald Lauder and the real estate magnate Mortimer Zuckerman, both of whom went on to chair the conference; with the casino mogul Sheldon Adelson, one of the largest donors to AIPAC and the more right-leaning Zionist Organization of America; and wit Irving Moscowitz, a major funder of settler and pro-settler groups in Israel and the United States. To be sure, Netanyahu's American circle represented only a subset of the broader community of large donors to major Jewish organizations, but it was unparalleled among Israeli politicians. When Netanyahu first ran for the Knesset in 1988, he was virtually unknown in Israel but already a celebrity among activist American Jews. When Netanyahu returned to Israel to run for office, he and his American Jewish backers maintained their symbiotic relationship. Lauder and Moscowitz poured money into Netanyahu's campaigns. Lauder and Adelson helped to fund the Shalem Center, a think tank that reflects Netanyahu's hawkish views. Lauder employed Netanyahu's aides, and even his ex-wife. And Lauder introduced Netanyahu to the Republican political consultant Arthur Finkelstein, who ran his 1996 campaign for prime minister. Above all, Netanyahu and his American Jewish allies worked together to undermine the effort to create a Palestinian state. As the leader of the Likud in the mid-1990s, Netanyahu lobbied aggressively in Washington against Prime Minister Yitzhak Rabin's agenda. While Rabin supported American aid to the Palestinian Authority, Netanyahu urged members of Congress to oppose it. His effort paid off in 1995, when New York's Republican senator Alfonse D'Amato--a fellow Finkelstein client--introduced legislation banning direct U.S. assistance to the Palestinians. Beinart declares that quietly, AIPAC and the Presidents’ Conference subverted Rabin’s efforts, too. In the ten months after Rabin’s September 1993 handshake with Arafat on the White House lawn, the Presidents’ Conference did not issue a single press release supporting his peace efforts. The story was similar at AIPAC, where according to former staffer Keith Weissman, key figures in the organization “were sucking at the teat of Likud,”--lobbying to move the U.S. embassy in Israel from Tel Aviv to Jerusalem. Better Jewish education is essential to American Jewish survival, and thus to our ability to fulfill our obligations to the Jewish state. But its impact will be slow, perhaps too slow to stop the settlement process that menaces Israel’s future. In the short term, preserving Israeli democracy will require something else: direct action against the occupation. The idea will unnerve many American Jews. It unnerves many American Jews. It unnerves me. But we must weigh this discomfort against the very real prospect that Israeli democracy will die. The hour is late. We can no longer afford our old comfortable ways. Since the beginning of the Oslo peace process, American Jews troubled by the occupation have focused mainly on influencing the U.S. government. In 1993, a group of influential American Jewish liberals, many with ties to Bill Clinton, founded Israel Policy Forum to help Clinton broker a two-state solution. In 2008, Jeremy Ben-Ami, a former staffer in the Clinton white House, created J Street to act as Barack Obama’s “blocking back” in Congress as he tried to re-launch the peace process. These efforts are important, but in and of themselves they are not enough. Changing Israel policy in Washington is hard because liberal Jews wield little influence in a Republican Party substantially beholden to the Christian right. And even in the Democratic Party, where many members of Congress privately support American pressure on Israel to halt settlement growth and negotiate seriously toward a two-state deal, those members often see the opposite in public. In the last three years, J Street has raised large sums of money for members of Congress willing to speak their minds. But AIPAC and its allies have spent decades making friends on Capitol Hill and making politicians fear the consequences of not being AIPAC’s friend. When Obama, a Democratic president genuinely committed to ending the occupation, ends up capitulating to an Israeli prime minister whom many Democrats privately loathe, it is hard to imagine any American president significantly challenging Israeli behavior anytime soon. And thus far no Israeli prime minister, even those more committed to a Palestinian state than Netanyahu, has been able to curb settlement growth on his own. Liberal Zionists should keep trying to influence American policy. But we must also recognize that the Israeli-Palestinian conflict is increasingly bypassing Washington. Middle Eastern governments like those in Turkey, Egypt, and Saudi Arabia are becoming less deferential to the United State. In the Quartet—which one served mostly as a fig-leaf for American policy—the European Union and Russia are challenging American leadership. As Mahmoud Abbas’s bid for UN statehood had made clear, Palestinian leaders no longer want the United States to control the peace process either. Abbas has caught up to the activists in his own society, who in recent years have turned their attention away from the American sponsored peace process and toward the struggle for global public opinion. The Palestinian bid at the UN may not change realities on the ground, but it will boost what has since 2004 become a key initiative of the Palestinian national movement: the effort to convince people across the world to boycott, divest from, and sanction (BDS) the state of Israel. For Palestinians and their supporters, BDS has proved a shrewd tactic. As a nonviolent movement, it turns the world’s attention away from terrorism, which has long undermined sympathy for the Palestinian cause. It gives activists frustrated by American’s unwillingness to pressure Israel a mechanism to do so themselves. And it capitalizes on the revulsion that many people whose nations were once colonized—or were once colonizers—feel toward an Israeli occupation with clear colonial features. The Israeli government and its American Jewish allies are devoting enormous energy to stopping the BDS movement and improving Israel’s public image, but those efforts has a moral problem. You can’t sell occupation in a postcolonial age. Nonetheless, when Israeli and American Jewish leaders criticize the advocates of BDS for “de-legitimizing” Israel, they have a point. Many in the BDS movement are doing just that: challenging Israel’s legitimacy as a Jewish state. Officially, the Palestinian civil society groups that coordinate the global BDS campaign take no position on whether the Israeli-Palestinian conflict should culminate in two states near the 1967 lines or one bi-national state between the Jordan River and the Mediterranean Sea. But prominent figures in the BDS movement openly advocate the latter option. And by targeting all of Israeli society—and frequently comparing their effort to the global anti-apartheid struggle—the BDS movement sends the message that just as the apartheid state was dismantled in South Africa, so must the Jewish state be dismantled today. The challenge for Zionists who cherish Israeli democracy is to counter this erasing of the green line by reinforcing: to de-legitimize Israel’s occupation while legitimizing Israel itself. This task starts with language. Israeli and American Jewish hawks often refer to the territory east of the green line by the biblical names Judea and Samaria, thereby suggesting that it was, and always will be, Jewish land. It was only after Jordan conquered the territory in 1948 that the term “West Bank” to distinguish it from the rest of the kingdom that falls on the Jordan River’s east bank. Since Jordan no longer controls the land and since neither Palestinians nor the Jordanian government want it to do so in the future—“West Bank” is an anachronism. It says nothing meaningful about the territory today. What we should call the West Bank is “nondemocratic Israel.” The phrase suggests that there are today two Israels: a flawed but genuine democracy within the green line and an ethnically based non-democracy beyond it. It counters efforts by Israel’s leaders to use the legitimacy of democratic Israel to legitimize the occupation and by Israel’s adversaries to use the illegitimacy of the occupation to de-legitimize democratic Israel. Having made that rhetorical divide, American Jews should look for every way possible to reinforce it. We should lobby the U.S. government to exempt settler goods from its free trade deal with Israel. We should push to end IRS policies that allow Americans to make tax-deductible gifts to charities that fund settlements. We should urge the U.S. government to require Israel to separately mark products from the settlements, as the European Union now demands. Then we should stop buying those products and stop investing in the companies that produce them. Every time Avigdor Lieberman or any other prominent public figure from nondemocratic Israel come to the United States, he should be met with pickets. Every time any American newspaper calls Israel a democracy, we should urge that it include the caveat: only within the green line. Peter Beinart states that as I write this, I cringe. When I see a Jew—any Jew—I feel a bond. No matter his politics, he and I share a people, a people whose members have often had little to rely on but one another. A grand new counter trend strategy for global order. 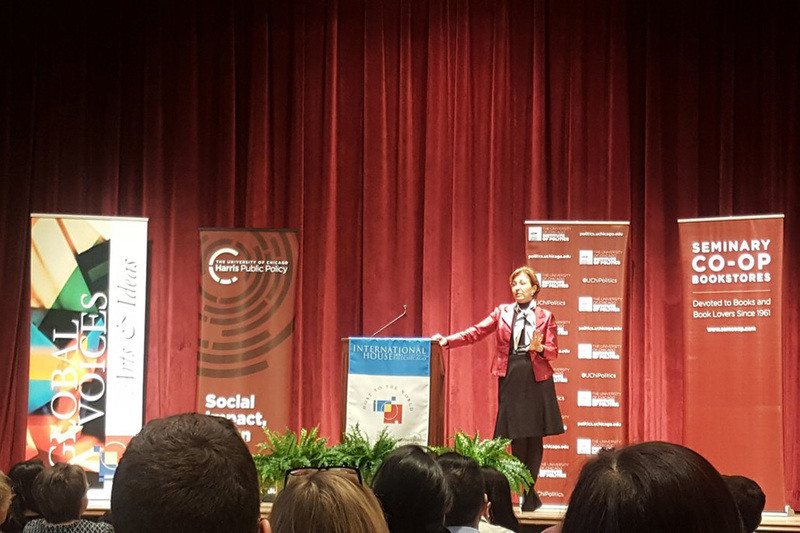 Big foreign policy thinker Anne-Marie Slaughter says embrace connections not borders. Plus: A first-round look the results of the French presidential election. Foreign Affairs: How to Succeed in the Networked World -- "To see the international system as a web is to see a world not of states but of networks. It is the world of terrorism; of drug, arms, and human trafficking; of climate change and declining biodiversity; of water wars and food insecurity; of corruption, money laundering, and tax evasion; of pandemic disease carried by air, sea, and land. In short, it is the world of many of the most pressing twenty-first-century global threats." New York Times: A New Rule Book for the Great Game — "The grand strategy she proposes is an international order based on three pillars: open society, open government and an open international system. Open versus closed, she declares, is the fault line of the digital age, the way capitalism versus Communism was in the last century. In the new order, in which competing states have been replaced by networks, openness means participation, transparency, autonomy and resistance to controls or limits on information." This program aired on April 24, 2017. Peter Beinart writes that the Quartet—served mostly as a fig-leaf for American policy—the European Union and Russia are challenging American leadership. And we should urge the U.S. government to require Israel to separately mark products from the settlements, as the European Union now demands. Then we should stop buying those products and stop investing in the companies that produce them. If you dance to the music; you must pay to the piper in politics and real life!